(Front row left to right): Jordan Koziol and Kathryn Bonti. (Back row left to right): Tyler Troyer, Logan Manderscheid, Anne Boyle, and Joseph Kemmerling. Photo courtesy Professor Brooke Bowman. Stetson University College of Law students Jordan Koziol, Logan Manderscheid and Tyler Troyer won the 11th Annual Civil Rights and Liberties Moot Court Competition at Emory University School of Law in Atlanta, Georgia, on Oct. 22. The team argued in front of two federal circuit court judges and a state supreme court justice. 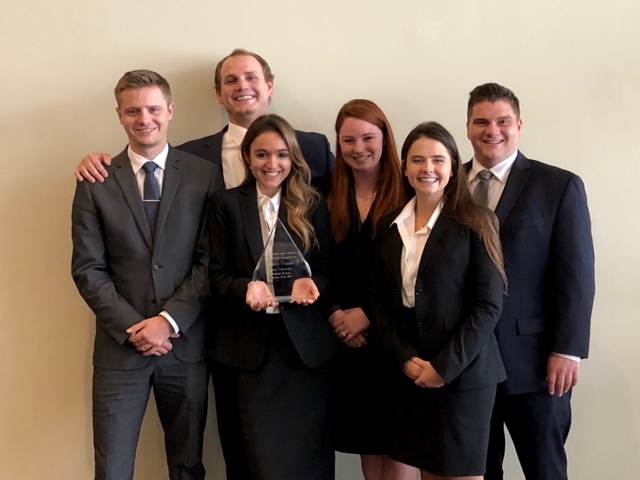 A total of 30 teams from around the country travelled to Atlanta to compete in the 11th Annual Civil Rights and Liberties Moot Court Competition. Stetson sent two teams to the competition. A second Stetson team of Kathryn Bonti, Anne Boyle and Joseph Kemmerling were quarterfinalists in the competition. Stetson Moot Court Director Professor Brooke Bowman and Jason Lambert B.B.A. ’02, J.D. ’12 co-coached the teams. The students argued two issues: whether a police officer’s use of a taser gun in dart mode was excessive force, and whether a police officer may search and seize a cell phone, without a warrant, under the Fourth Amendment.